What is a Back Mouse? Episacral lipomas in the lower back, the pain associated with them and treatment options available. This is a very strange sounding medical condition that is fairly common for adults, with an estimated prevalence of one per 1,000 in the general population. 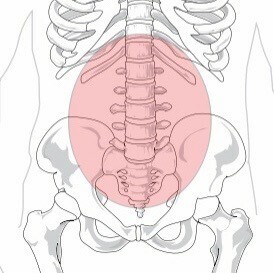 They can be located in the regions of the sacroiliac, posterior superior iliac, and the lumbar paraspinal area. Many times, patients are not aware that they have one (or more) until it becomes painful. The textbook description of an episacroiliac lipoma might be a lumbar fascial fat herniation. An easier way of saying this is that it is a lump of fatty tissue, surrounded by a thin, fibrous capsule that lies between your skin and the underlying muscle and is located in the lower back. They are rarely associated with any type of infection or cancer and can range in size and the number present. A small round lump (less than 2 inches) located in the regions of the sacroiliac, posterior superior iliac, and the lumbar paraspinal area. The lump may be firm and rubbery, movable with slight pressure. Typically tender to the touch but can cause extreme pain in some individuals. Pressure exerted on the area (sitting in a hard chair or laying on a firm bed) can increase the pain. They can be located on either or both sides of the back. Pain from a back mouse can radiate to the buttocks or knees but seldom travels below the knees. The cause of lipomas, in general, is not well defined. 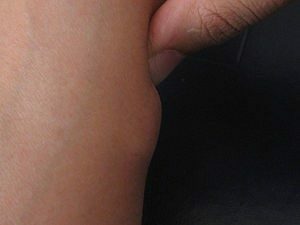 Some research indicates that they are due a genetic abnormality, while others see the cause linked to trauma in the area where the lipoma develops. In the case of trauma to the back, this type of lipoma may be referred to as a post-traumatic pseudo lipoma (PTL). They are benign, soft tissue nodules that develop in various anatomic sites following an acute or chronic event(s) or due to repetitive trauma. Why does a back mouse cause pain? The answer to this that it is not completely known. Lipomas that have been examined after surgery do not show any evidence that the cause of pain was from inflammation, although nerve fibers can be found in the capsule that surrounds it. 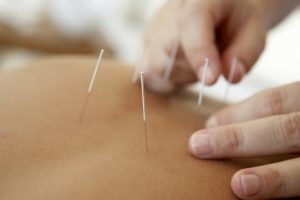 Researchers have found that patients often experience immediate relief of pain from multiple needle punctures into the back mouse, compared with poor relief with a single puncture. This might suggest that the pain is being caused by increased intra-nodular (within the lipoma) pressure. How is a back mouse diagnosed? This diagnosis can usually be made by clinical examination alone. When there is any doubt, a referral for imaging or an appointment with a specialist’s opinion. Ultrasound, MRI and CT scans may be used, depending on the availability and cause of suspicion. MRI is the imaging method of choice and biopsy is not usually required if an MRI is available. There are several options when it comes to back mouse treatment. First of all, if they are not painful, then they can be left alone. The size of a back mouse usually slows significantly after the initial growth or injury. However, they may need to be removed if there is compression of surrounding structures or if the diagnosis is uncertain. Because these lipomas generally do not spread into the surrounding tissue, they can be easily removed with a small incision. A small stab incision is made, followed by dissection of the lipoma and it is then removed in pieces. A recent literature review found that back mice represent a treatable cause of low back pain that is relatively easy for a health care professional to identify. This is based on a proper history and physical examination. In the case described in the authors’ report, it is was found that injections of a local anesthetic and corticosteroid with repeated needling resulted in alleviation of pain and improved the patient’s functional status. This kind of treatment can avoid unnecessary diagnostic testing and more invasive procedures.